We were honored to host a Ironbound Walkshop Tour with young people from the 2014 Park Works Summer Environmental Enrichment Program under the leadership of Mildred Helms Park Resurrection Committee and Friends of Jesse Allen Park! This entry was posted in Youth Education on June 26, 2014 by riverfrontcoordinator. Great to have the Youth Rangers from the Mildred Helms Park Resurrection Committee visit the changing Ironbound riverfront this week. We looked at how things like zoning, environmental remediation, and community activism have shaped the landscape Thanks to Jacques Benaroch from PSE&G for his impromptu lecture on manufactured gas facilities! This entry was posted in Youth Education on August 16, 2013 by NRR. On Saturday, June 15, Newark Riverfront Revival was happy to host a church youth group to help think of ways to activate the soon-to-open second segment of riverfront park. The group brainstormed ideas for the Orange Party on August 3 to celebrate the park’s opening. We met and interviewed one of the construction supervisors, a graduate of West Side High School. At the east end of Essex County Riverfront Park, we spoke with Kevin Sampson, the lead artist on “Song of the Passaic,” the mural-in-progress overlooking the park by Newark Murals. This entry was posted in Building Things, Youth Education on June 15, 2013 by NRR. 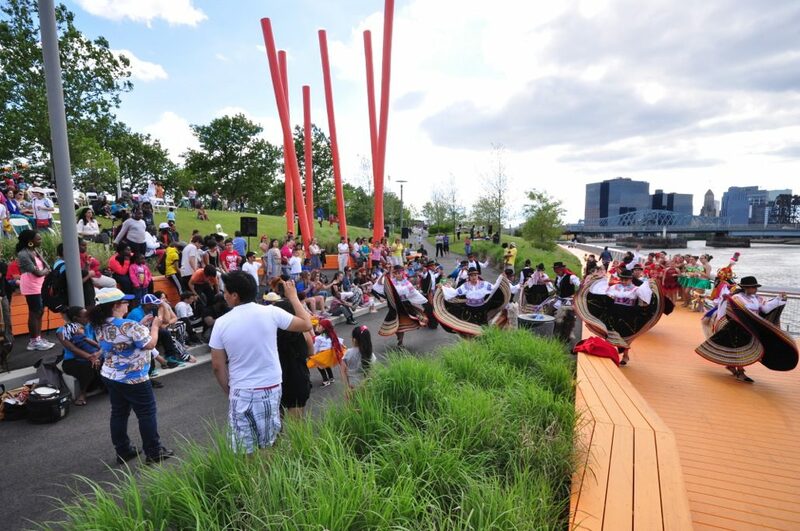 From the beginning of the design process for Newark’s second segment of riverfront park, many residents advocated for this area, which is too narrow for sports fields, to be a place for environmental education. Sister Carol Johnston reminded us all that this meant learning about the river, the plants, and the animals, and also, especially here in Newark, about how people come together to make the riverfront a better place: the movement for environmental justice is the story of why this park exists. A large-scale routed map of Newark will show every Newark neighborhood in relationship to the river. Selected steel rails along the boardwalk will be cut with water jets to illustrate how things work on the river, including factories, watersheds, sewers, and wildlife. Screenprinted and enameled signs will be mounted on logs illustrating the nuts and bolts of river life led by Lenape people, the Morris Canal, Ironbound park supporters, and the Balbach Smelting Works. This entry was posted in Building Things, Youth Education on May 16, 2013 by NRR. 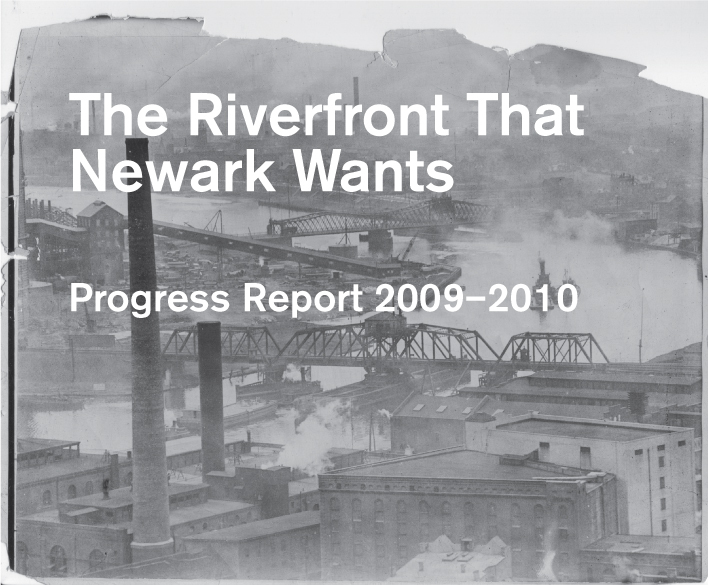 At the fourth biennial Passaic Riverfront Institute, Newark Riverfront Regeneration presented an update on two years of riverfront work with “The Riverfront That Newark Wants: Progress Report 2009-2010.” Click below or here to download the PDF. This entry was posted in Building Things, Public Programs, Rules for Development, Youth Education on August 4, 2010 by newarkriverfront.